The Competition Commission is to focus on competition at the local level in the next phase of its probe into the UK's grocery industry. 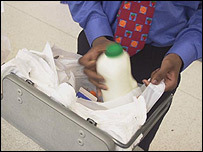 The commission has been examining the supply chain, planning and land banks of the four big UK supermarkets. Tesco, Asda, Sainsbury's and Morrisons control almost 75% of the UK market. The commission said questions remained whether Tesco or any other supermarket could get into such a strong position that no other retailer could compete. The commission said it was "not here to punish success or individual retailers". But it added: "We are concerned with whether Tesco, or any other supermarket, can get into such a strong position, either nationally or locally, that no other retailer can compete effectively." The number of stores operated by the big four has doubled since 2000. "We are really at the information gathering stage of this exercise, rather than the stage when they reach firm conclusions and remedies," said the BBC's Business Editor Robert Peston. "But they do seem to imply that there is not sufficient competition at the local level." James Lowman, chief executive of the Association of Convenience Stores - which represents 32,000 local shops - said he was encouraged by the interim report. "They have identified strong indications of anti-competitive practices in the UK grocery market that need further detailed consideration," he said. "Overall we are one step closer to a fairer grocery market." But Tesco chief executive Sir Terry Leahy, said the report had dispelled "the myths" surrounding industry manufacturers, processors or wholesalers. He added: "I believe passionately that consumers have benefited in so many ways from the intense competitive rivalry in this industry." Peter Freeman, chairman of the commission and inquiry group chairman, said: "Our principal concern now is to focus on competition between retailers at the local level, where it most matters to consumers, as this is where many of the potential concerns we have would be evident." He said they now needed to see what choices shoppers had in particular areas and how competition works between retailers of different sizes. "It would be a cause for concern if supermarkets, either individually or collectively, were in a position to increase prices or lower their offer in any particular locality or region because of lack of effective competition," he added. The commission said larger stores constrained the prices, product range and service of smaller stores. Below-cost selling by larger grocery retailers "may also unintentionally contribute to the exit of smaller grocery retailers and specialist stores," it said in its statement. The Competition Commission's "emerging thinking" document also said it had examined the relationship between the big supermarkets and suppliers, amid allegations that supermarkets' buying power has increased. "We have considered the evidence supplied concerning relationships between grocery retailers and their suppliers," said Mr Freeman. "Whilst these haven't indicated widespread problems in the supply chain, there are still concerns. "We have found that bigger buyers do not always appear to get better terms from suppliers, and food and drink manufacturers and processors, as well as wholesalers, seem to be in reasonable shape. "However, we have some concerns about farmers and we have not received as much specific evidence about unfair treatment of suppliers as we might have expected." It asked for any suppliers with examples of unfair treatment to come forward and speak to it in confidence. The commission also said the number of dairy and pig meat farmers had declined in recent years, showing there were "significant difficulties" in those sectors. Claire Melamed of charity ActionAid said three million people in the developing world supplied food to the leading UK supermarkets. She said those overseas suppliers were seeing "wages and living conditions going down and down, while supermarket profits are going up and up". Campaign groups have criticised supermarkets for owning large areas of undeveloped land across the UK, stifling potential competition. And the commission says it will now consider the implications of these land holdings as part on an analysis of competition between retailers. It added: "There is conflicting evidence on the effect of planning controls - some say they are too restrictive, others that they are not restrictive enough." Dr John Marti, of Southampton University said the report had offered "not a lot" for those looking for criticisms of the big four's operations. He added: "The commission has not had a lot of evidence of the four supermarket groups squeezing suppliers."